Composite materials combining arc resistant refractory metals with silver or copper for increased conductivity. The ELKON® Family of Hybrid Refractory Composite Contact Materials combines the high wear resistance and arc tolerant advantages of tungsten, tungsten-carbide and Molybdenum with the superior electrical and thermal conductivity of Copper and Silver. ELKON Silver-Tungsten composites provide high conductivity, low resistivity and high resistance to mechanical wear and arc erosion for high voltage, high temperature, heavy-duty switching applications in oxidizing atmospheres. Additionally, the combination of tungsten carbide and silver creates an even harder material with superior mechanical wear and arc resistance and a higher resistance to contact welding or sticking. ELKON Copper-Tungsten composites provide lower cost alternatives with excellent wear and conductive characteristics for applications in non-oxidizing atmospheres such as gas filled or oil filled devices. 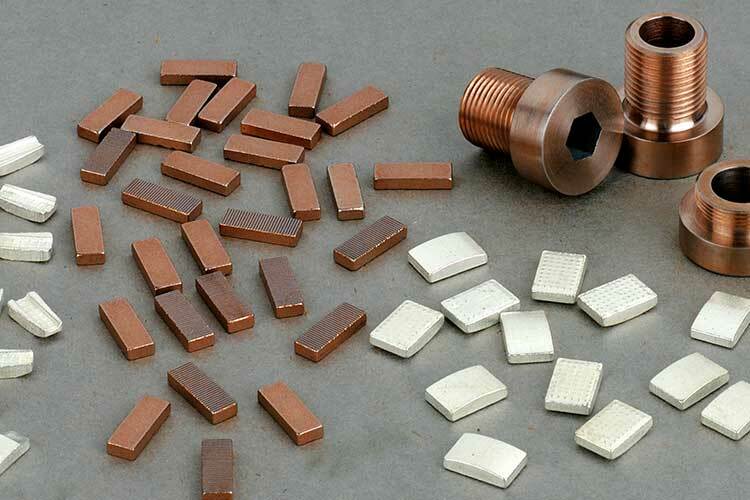 Copper-Tungsten exhibits even higher resistance to arc erosion than Silver-Tungsten, very high mechanical strength and is highly resistant to thermal and mechanical shock. Common uses include high voltage arc runners, arcing tips, spark gap electrodes, contact tips, plunger tips and tulip style receivers. ELKON A25 25% Silver / 75% Tungsten. ELKON 20S 27% Silver / 73% Tungsten. ELKON 35S 35% Silver / 65% Tungsten. ELKON 50S 49% Silver / 51% Tungsten. ELKON A80 80% Silver / 20% Tungsten. Extruded. ELKON A90 90% Silver / 10% Tungsten. Extruded. ELKON R45 45% Copper / 55% Tungsten. ELKON R32 32% Copper / 68% Tungsten. ELKON R30 30% Copper / 70% Tungsten. ELKON R25 25% Copper / 75% Tungsten. ELKON 30W3 20% Copper / 80% Tungsten. ELKON 40W3 13% Copper / 87% Tungsten. ELKON 50W3 10% Copper / 90% Tungsten. ELKON G11 60% Silver / 40% Tungsten Carbide. ELKON G12 65% Silver / 35% Tungsten Carbide. ELKON 3042 58% Silver / 42% Tungsten Carbide. ELKON G13 50% Silver / 50% Tungsten Carbide. ELKON G14 40% Silver / 60% Tungsten Carbide. ELKON G15 35% Silver / 65% Tungsten Carbide. ELKON TC5 50% Copper / 50% Tungsten Carbide. ELKON TC10 44% Copper / 56% Tungsten Carbide. ELKON TC20 30% Copper / 70% Tungsten Carbide. ELKON G17 40% Silver / 60% Molybdenum. ELKON G18 50% Silver / 50% Molybdenum. ELKON AM40 40% Silver / 60% Molybdenum. Press, Sinter, re-Press. ELKON AM50 50% Silver / 50% Molybdenum. Press, Sinter, re-Press.